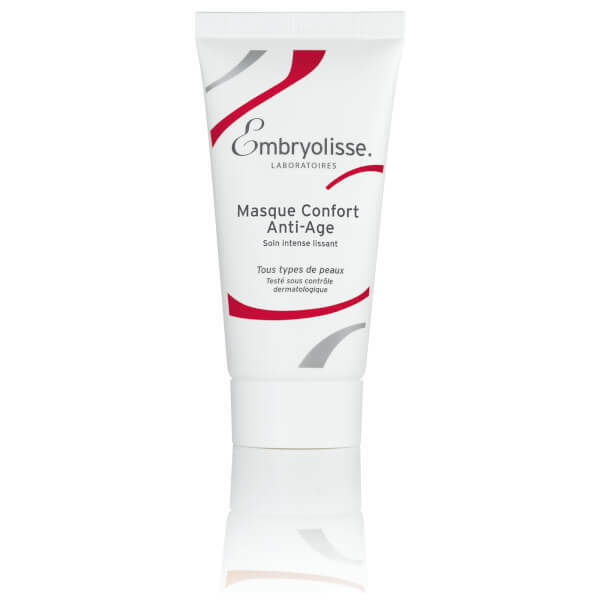 Revitalise skin’s youthful capacity with the Anti-Age Comfort Masque Tube from French pharmacy skincare label, Embryolisse; an age-reversing mask that contributes to restart the skin’s vital functions. Stimulating, restructuring, and moisturising the complexion, the nourishing mask helps to diminish the appearance of fine lines and wrinkles, whilst toning the face for a radiant finish. Enriched with a nutritive cocktail of Sweet Almond, Apricot and Cotton Butters, the formula is rich in essential fatty acids, vitamins and antioxidants, which help to enhance the cellular regeneration process thus restoring skin’s tonicity and elasticity. Ultra-hydrating plant-based Mimosa, Sunflower and Jojoba Wax Butters soften and condition the skin, whilst plumping Hyaluronic Acid enhances the bonds between the epidermis layers through intense moisture replenishment. Finally, Vitamin E further strengthens the skin as a whole to combat oxidative ageing. 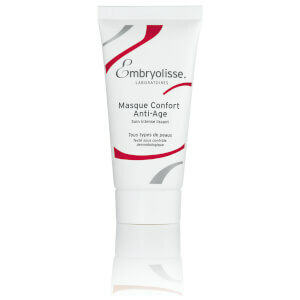 Use the Anti-Age Comfort Mask once or twice a week to prevent and repair thin and dry skin subjected to premature ageing from the age of 30. Apply a thick layer of the product evenly to the face and neck for 10 to 15 minutes in the morning or in the evening; remove excess cream with a makeup removal cloth. The mask can also be left on overnight, so you wake up looking rested and rejuvenated. Aqua (Water), Caprylic/Capric Triglyceride, Glycerin, Acacia Decurrens/Jojoba/Sunflower Seed Wax Polyglyceryl-3 Esters, Cetyl Alcohol, Glyceryl Stearate, Prunus Amygdalus Dulcis (Sweet Almond) Oil, Peg-75 Stearate, Gossypium Herbaceum (Cotton) Seed Oil, Cera Alba (Beeswax), Hydrogenated Sweet Almond Oil, Prunus Armeniaca (Apricot) Kernel Oil, Hydrogenated Cottonseed Oil, Ceteth-20, Steareth-20, Hydrogenated Apricot Kernel Oil, Butylene Glycol, Peg-40 Hydrogenated Castor Oil, Parfum (Fragrance), 1,2-Hexanediol, Caprylyl Glycol, Allantoin, Carbomer, Tocopheryl Acetate, Linoleic Acid, Linolenic Acid, Sodium Hydroxide, Retinyl Palmitate, Glyceryl Polyacrylate, Sodium Hyaluronate, Tocopher.